SolderSmoke Daily News: N2CQR Wins a Contest AGAIN! Pete N6QW suggested I do a blog post on this. This past weekend I dusted off my old scratch-built, all-analog, no-chips BITX20. (THREE CHEERS FOR FARHAN AND HIS BITX DESIGN!) I hooked it up to my trusty CCI .1KW (note decimal point) amplifier and my new 135 foot store-bought doublet. 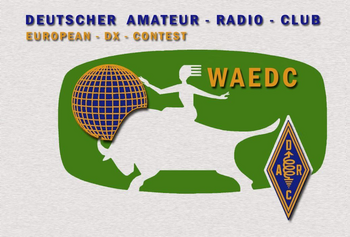 This all happened just as the Worked All Europe DX contest was kicking off, with lots of activity on 20. TRGHS. I was in. My contest operating style was in the category of "relaxed-casual-noncompetitive." I took a lot of breaks. In fact there were more breaks than non-breaks. You have to pace yourself in the contest world. 8 SEPT: DF0HQ, SN7D, GM6X, DP6A, S51A, DL0HN, DB0HX, OZ5E, DJ5MW, HG7T, IK4UPB, VY2ZM, G6XX, EF1A, LZ5R, 9A5W, YP0C, F6HQP, DL7ON, HB9DQL, ON6NL, DA0WRTC, 9 SEPT: EI7M, P3X, RU1A, DP7D, SP2KPD, DL0WW. P3X might not count because, you see, Cyprus is considered to be in ASIA. Really? Anyway, I 'm assuming that I am the winner in the homebrew, discrete component , all-analog transceiver category. Woo Hoo! The contest rig is pictured above. Before you point to the glowing numerals and cry foul, realize that the little Altoids box between the two speakers holds a San Jian frequency counter that was deliberately kept OUTSIDE the BITX box. So it is more of an outboard accessory. I can run the BITX 20 without the digital assist -- I have an old fashioned non-digital dial pointer to indicate frequency. The "Low - High" switch you see switches the VFO from the low portion of the 20 meter phone band to the higher part of the band. The box below the BITX 20 holds the uBITX. Seriously though, I was quite pleased with the performance of the doublet.